The closer to the thermoelectric cooler, the better cooling effect is. Non-professionals are prohibitted to open the machine for repair. Both AC and DC wire must be tightly connected. Any fresh food should not be put into it before being packed. It is prohibitted to directly push the switch from the cooling position to the warming position and vice versa. Before switching between the two modes, the switch must be push to the OFF position and the machine should be shut down for 30 minutes at least. 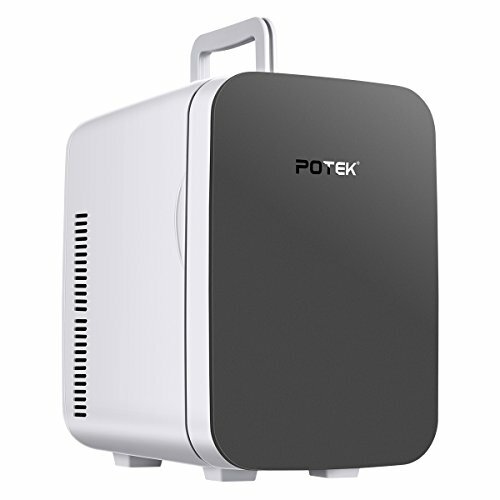 The POTEK 15L mini fridge cooler and warmer, using imported semiconductor cooling technology, can not only refrigerate but also warm food.Ideal for Vehicle, home, yacht, office ,make-up store and etc. Characterized by quiteness, free of CFC, low power consumption, high efficient cooling and heating function, long operating life, nice appearance, small size and easy to carry, it is both an environmental product recognized over the world and a good helper for home life and journey. Included with AC and DC power adapters - Easy to go from indoor 110V (AC) to car use by plugging the appliance into the car cigarette 12V (DC) adapter. Also great for use on boats, RVs and while camping or picnicking. The thermoelectric cooler can serve as long as 85,000 hours and the service life of DC cooling fan is 30,000 hours; heat insulation ensures the service life of product; a strong refrigerating ability makes the temperature about 64.4°F lower than current ambient temperature but the lowest is 39.5ºF; heating is set through the temperature controller and the temperature can be set as high as 149°F. If you have any questions about this product by POTEK, contact us by completing and submitting the form below. If you are looking for a specif part number, please include it with your message.